We provide a digital self-service experience for IT and non-IT services with native mobile applications, virtual agents (bots), social collaboration, and ChatOps, all driven by machine learning, analytics, and automation. All of it based on Micro Focus SMAX technology. Dynamically discover services and dependent resources and activate domain-specific agent and agentless monitoring of on premise, private, and public cloud environments. Ensure the health of any cloud, XaaS, or on premise service by automatically determining which link is impacting business – keeping to SLAs, and optimizing resource spend. 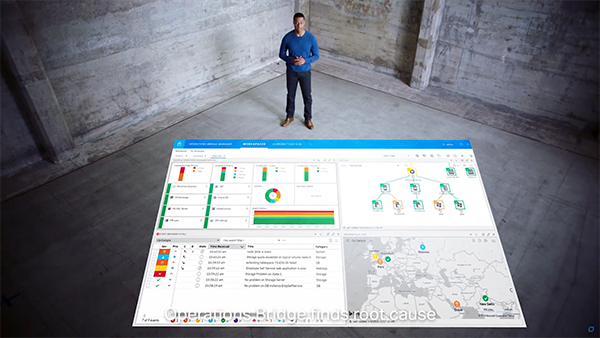 See a consolidated, end-to-end view of your environment with over 200 tool integrations available without rip and replace. Extract the signal from the noise to focus operations on root cause, not just symptoms. Drive automated AIOps with machine learning derived from more than 50 patents. Includes anomaly detection and predictive analytics for all data types, events, topology, metrics, and logs – with no configuration required. Accelerate and automate tasks for remedial actions and recovery procedures with ChatBots and over 8,000 runbooks, including out-of-the-box integrations to popular ITSM tools. View business and IT status in real time through Business Value Dashboards streamed on popular devices. Operators gain fast, interactive, and historical analysis of hundreds of metrics from our extensive KPI library.